AAW member Thomas P. Ramirez ghost wrote this and several other Phoenix Force novels in the 1980s. Evidence that books are eternal, a novel written in 1982 by Allied Author of Wisconsin member Thomas P. Ramirez was recently reviewed at Chess, Comics and Crosswords. 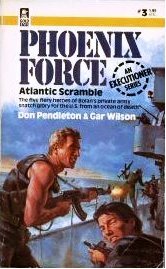 The review of Phoenix Force: Atlantic Scramble appeared as part of the blog’s “Friday’s Forgotten Books” feature. Ramirez ghost wrote the book, along with several other installments of the action-packed military fiction series. This entry was posted on Friday, June 21st, 2013 at 3:39 pm	and posted in AAW History and Affiliates. You can follow any responses to this entry through the RSS 2.0 feed.